One’s a new Luard related member, and the other a Demon Castle. 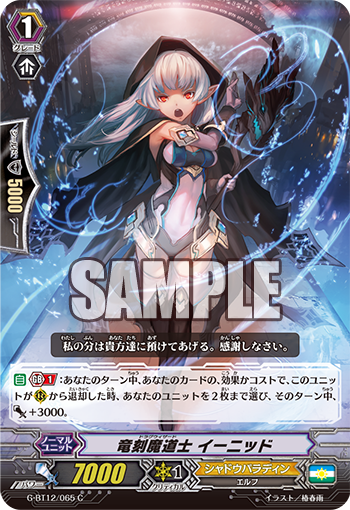 AUTO Generation Break 1: During your turn, when this unit is retired from RC for the cost or effect of your card, choose up to two of your units, and they get Power +3000 until end of turn. “Dragwizard, Enid” when retired from the Rear-guard Circle due to the card effect or cost of an ally, can grant 2 other allies 3000 Power! If you use it along with the likes of “Black Dragon, Carnival Dragon”, those Units’ll gain a total of 7000 Power, allowing you to put a ton of pressure on the opponent. Also if you retire “Enid” with the Stride Bonus of “Dragheart, Luard” or so such, you can increase the Power of the Units you Call, so you can use this ability in various ways. And “Demon World Castle, Fangenbose” grants a “Promising Knight, David” like ability to Units. When it enters the Rear-guard Circle, you can choose another of your ally Rear-guards, and grant it a “This Unit can be treated as 2 Units for a cost or card effect that retires.”! This is a good skill to use for Units whose skills require a heavy cost, such as “Supremacy Black Dragon, Aurageyser Doomed”! After today as well, we’ll be introducing cards from “Dragon King’s Awakening”! So please enjoy!